Casiana Fometescu, CO2 international consultant, attended IETA EU Working Group Strategy Meeting in Brussels, representing ALLCOT Group as Business Development Strategist for Eastern Europe. 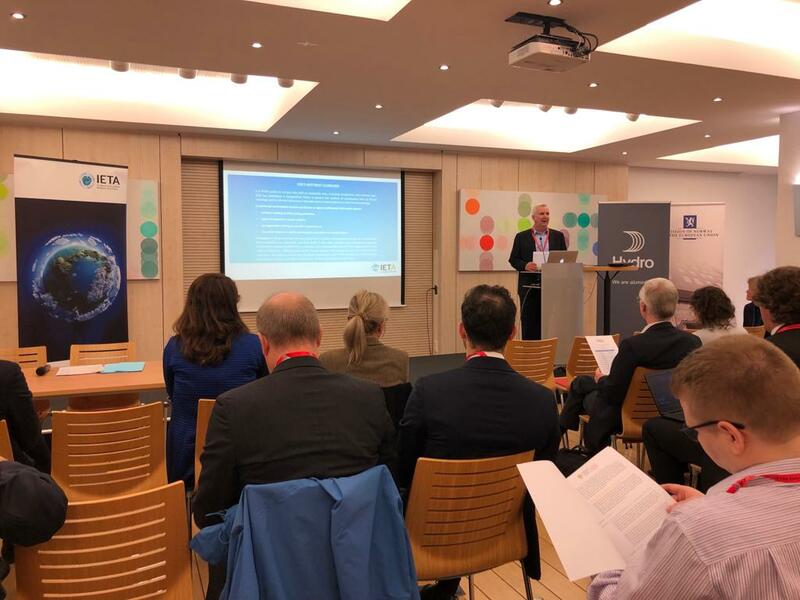 IETA EU-ETS Strategy meeting took place in Brussels on 1-2 April 2019. The first presentation was from the representative of the European Commission, DG Climate action, Mrs. Beatriz Yordi, a very open message that the Commission is always open to listen, understand and act towards better climate and business conditions. 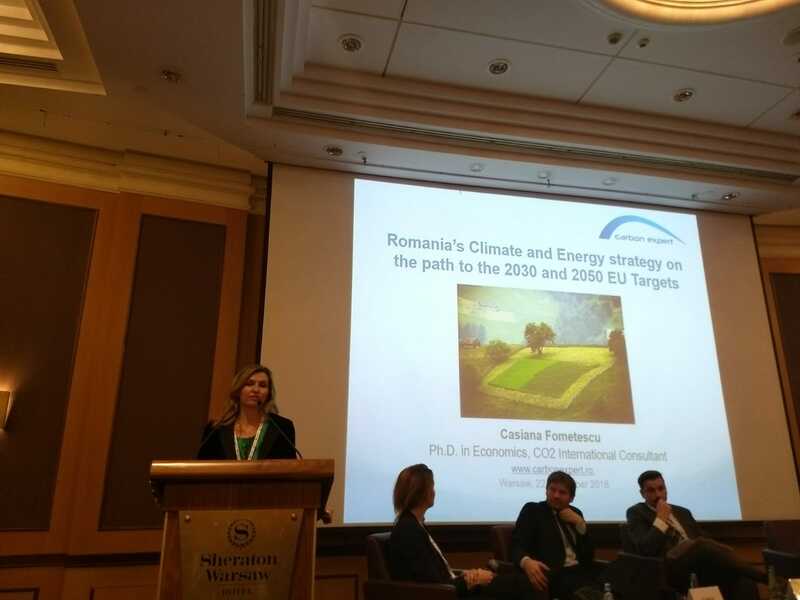 She emphasized the idea of the stable framework of the EU ETS, the fact that CO2 is becoming one of the largest financial commodity where billions of euro are under trade and other coming funds are now expecting through the ETS Modernization fund. Mrs. Yordi informed that revision of the auction regulation will start soon and IETA will be included in the consultations. EUAs continued Monday’s slow and steady rise, closing 2.9% higher at €21.55. Carbon kept pace with German power, while gas rose 1.4% and coal advanced 1%. While prices have risen by more than 4% since Friday, there doesn’t seem to be much conviction to this move. Block trades continue to account for nearly half the total volume on ICE Futures (nearly 17 million EUAs yesterday), which suggests investors and utilities are managing their positions quite actively, but screen volume is trending lower since the start of the year as Brexit continues to weigh on the market. b) the European Union would be willing to re-open talks on the withdrawal agreement. Our outlook for tomorrow is therefore neutral. It’s seems likely that the market will continue to grind higher in the absence of any change in fundamentals. However, it’s likely to be a quiet day as traders focus on events in Parliament. We note that EUAs today rose from just above the 50% Fibonacci retracement to just below the 38.2% retracement of the February-March rally. So resistance at €21.58 will be tested very quickly, and a move above would then target the €21.80-21.85 band that has acted as a support area most recently. · IETA (International Emissions Trading Association) will organize a meeting in Brussels on the EU ETS Strategy on the 2nd April 2019, and our CO2 international consultant, Casiana Fometescu, will be present at this event and will report you the upcoming news on the market. The pressure of weakening coal, gas and power prices finally told on carbon, and EUAs closed down yesterday, 18.03.2019, 3% at €21.80. A large increase in open interest in EU emissions trading system (ETS) allowance call options has been observed in the last days and is likely to have been prompted by a vote in the UK Parliament this week to reject a “no-deal” Brexit. The options buying is likely to have been triggered by a UK parliamentary vote on 13 March, held in the evening after the market had closed, which resulted in members of Parliament (MPs) voting to rule out the UK exiting the EU without a deal. The vote outcome appeared to reduce the risk that the UK will crash out of the carbon market on 29 March, which would be the default scenario under a no-deal Brexit. A no-deal scenario is widely considered to be bearish for EU ETS fundamentals, as UK emitters could sell 50mn-70mn allowances back to the market as they would no longer need these permits for compliance. 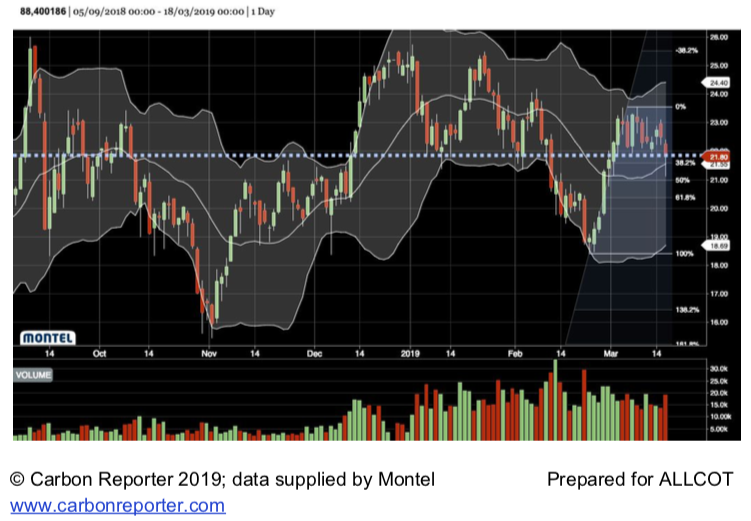 By removing the prospect of a no-deal Brexit — at least temporarily — the vote created more bullish sentiment among EU ETS market participants, and triggered the increase in open interest. For Tuesday, 18.03, we are neutral to bearish: EUAs ended the day back within their key support area at €21.70-21.85 and this may offer some support early tomorrow when trading resumes. The EUA market traded last week within the range of 22.04-23.17 Euro/EUA. The bullish sentiment that designed the market in the last few weeks is slowing down. From the one hand, Brexit concerns are starting to enter into consideration in particular now that a no-deal Brexit is taking shape for the next future. In particular, the compliance deadline for UK operators has been anticipated to the end of this week, 15 of March 2019, and it is very likely that most of the operators have already purchased the units they needed for next Friday deadline. In terms of bearish sentiment, we can also say that must-run capacity from gas-fired combined heat and power (CHP) and increasing coal-to-gas fuel switching has put German power sector gas burn on track to exceed coal-fired generation this week for the first time for any week, without at least one public holiday so far this decade. Moreover, with coal-fired generation likely to reach a decade low for a working week, there has been ample larger barge availability at Amsterdam-Rotterdam-Antwerp (ARA), even with Rhine levels rising and barge rates falling in recent days — suggesting coal-fired plant stocks are amply filled. In this scenario, we do not expect a strong bullish market for next week, but a market range between 21.50 and 23 Euro/EUA. At present time, the EUA is traded 22.37 Euro/EUA. EUAs spent most of the day bubbling just under the €23 mark. Prices made three attempts to move above this level but failed. Consequently, traders started to sell by around 16.30 CET and levels dropped sharply through to the close. Carbon ended the day down 3.6% at €22.11, just a cent above the day’s low. The €5 price rise over the last past eight days proved too attractive to pass up for the market, and speculators cashed in. The rally may well be over for now, but the continued absence of investor selling (as opposed to speculators) suggests that the gains of the last week may well be consolidated rather than given up. Two days ago, Bloomberg New Energy Finance has published new analysis in which it forecasts that the Total Number of Allowances in Circulation (TNAC) will shrink from 1.686 billion EUAs in 2018 to 1.465 billion in 2019. the implication is that net demand for EUAs from the surplus will come in at around 278 million EUAs. Distribution of free EUAs for 2019 is now well under way, with member states having completed more than 60% of their allocation for the year. This may dampen market demand from continental installations who may be tempted to borrow from their 2019 allocation rather than pay the current high prices. Yet, compliance season continues, and while industrials may have become more proactive in their risk management, there are still enough installations that continue to pursue a “once-a-year” buying strategy to suggest that underlying demand will remain reasonable. Today’s close at the day’s low suggests that there is still some selling to come, so we should anticipate further weakness on Thursday morning at least. We’re back within range of the €21.83 support that held firm in mid-January and early February. Below that the region around €20.55 offers some support, and finally the strong € 19 support is not an impossible target either. 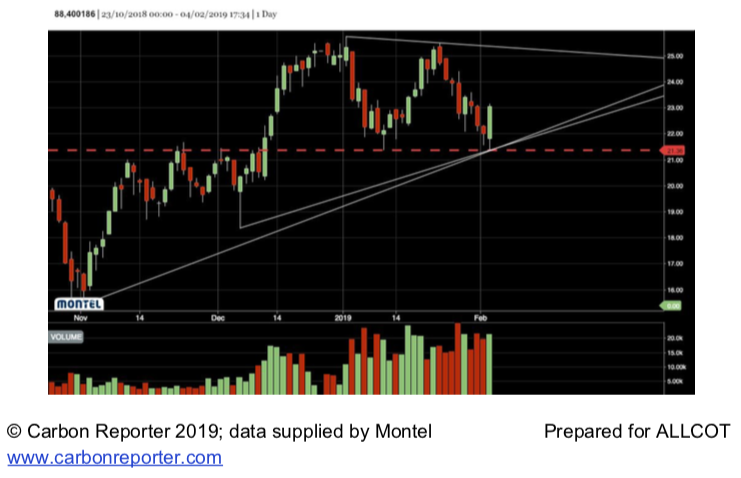 Today, 04.02.2019, carbon successfully defended the support at €21.36 before embarking on a rally that gained momentum as the day drew on, and eventually climbed back above €22.00. EUAs closed up 4.8% at €23.05. Carbon’s advance was in contrast to power and gas which both retreated by 0.5%, and coal which shed 1.4%. Supply of 10.6 million EUAs at auction this week is sandwiched between two weeks where more than 15 million allowances are being sold, and this pattern will repeat itself throughout the year. Today’s sale saw 105 separate bids, well above the average of any month since last summer. In addition, January saw an average of 30 bidders participate in each EEX auction, the highest on record. It’s clear from this data that demand is healthy, if not increasing, and it will be worth watching auction results in the coming month to see if the market has been encouraged to buy while prices remain below recent highs. Technically, Friday 01.02.2019 and today’s price action (04.02.2019) completes the “double top” pattern that takes in the respective peaks of January 1 and January 23. 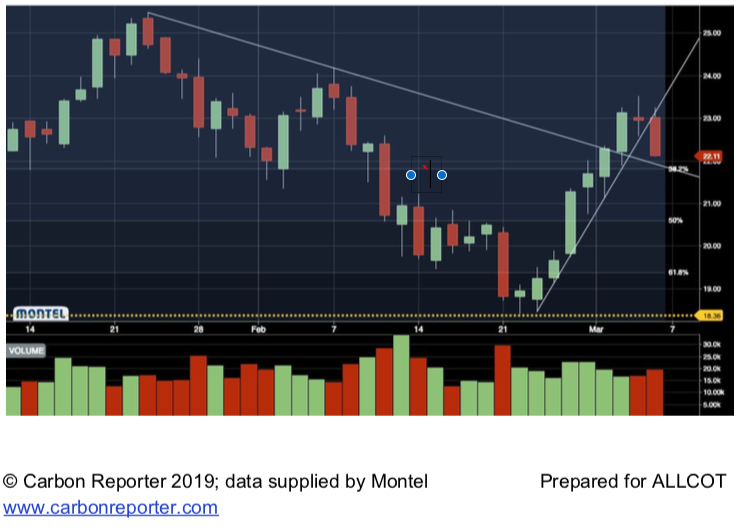 The decline since January 23 has reached parity with the drop that ended on January 10, and today’s gain may possibly be the start of a renewed rally. However, we would be cautious before setting a price target, and today’s move needs to be consolidated first. 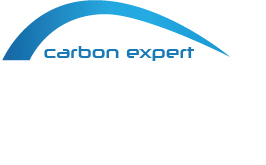 Today, 14.01.2019, the CO2 certificate closed at the ICE ECX stock exchange in London at a price of 22.58 Euro / EUA. Participants on this exchange attributed a slight decrease of 0.7% compared to Friday, 11.01.2019, to low energy and gas prices. Tomorrow, a higher volatility is expected as a result of the political news, particularly the vote on the Brexit Agreement in the British Parliament. Starting from 1st January 2019, all corporations that participate in financial transactions, including trading of emission allowances in the EU ETS, should be issued the Legal Entity Identifier (LEI). The Legal Entity Identifier is a unique identification of legal entities participating in financial instruments. The Markets in Financial Instruments Regulation (“MIFIR”) came into force forming part of the wider legislative package introduced by the Markets in Financial Instruments Directive 2014/65/EU (“MiFID II”). Amongst other matters, it introduces requirements for entities participating in financial transactions to be identified through a Legal Entity Identifier (“LEI”) code. If you need advice in acquiring LEI, please get in contact with us. If you already acquire it, please send us for subsequent CO2 trades. For information related to the set of documents requested before trading, we remain at your disposal. The UN Climate conference ended in December 2018, after two weeks of intense negotiations on ways to put the Paris agreement into practice. One of the major discussion points included how to account for and record green house gas emissions. Crucial issues such as what countries would do to limit temperature rise to below 1.5 degrees as was stated in the IPCC report were ignored. A decision on carbon markets was pushed to next year’s COP meeting as countries failed to reach an agreement. Climate experts have criticized the agreements drawn from the conference as being inadequate and not urgent enough to address the climate’s current challenges. A group of developing countries, the EU, and Canada have committed at COP24 to set tougher targets to cut greenhouse gases and raise their countries’ targets by 2020. They have resolved to put in extra measures to go beyond what had been agreed upon at the COP conference. Practical ideas on how this would be done was however not discussed and how they intend to achieve these goals is to be seen. As of 1st January 2019, the Market Stability Reserve will officially begin working. The MSR was set up to eliminate the surplus of emission allowances that has been accumulating in the EU ETS since 2009. 265 million EUAs will be placed in the reserve between January and August of 2019. Volumes will be significantly reduced in comparison to the previous years and this is expected to hike carbon prices as a result. Yesterday EUA closing price on ICE EXC exchange from London was 22,84 Euro. The European Commission has announced the suspension of all EUA sales issued by the UK as of 1st January 2019 until a Brexit deal between the UK and the EU is settled upon. This means that the UK will not auction or allocate allowances. Allowances already in circulation will not however be affected. The UK will leave the EU ETS immediately if a Brexit deal is not agreed upon. The absence of UK auctions and the German auctions that are yet to be confirmed is expected to keep prices high as the new year begins with less supply. Our attention looks to next Tuesday, 17.01.2019, when the UK Parliament will vote the withrawal agreeement from the EU. “The world must cut CO2 emissions 45% below 2010 levels by 2030 and achieve net zero emissions by mid-century if it is to stand a chance of limiting global warming to 1.5C”, the Intergovernmental Panel on Climate Change (IPCC) said on 10th October 2018, in a report highlighting the far-reaching differences in impact between 1.5C and 2C of warming. The Special Report on Global Warming of 1.5°C will be a key scientific input into the Katowice Climate Change Conference in Poland in December, when governments review the Paris Agreement to tackle climate change. The EU emission reduction targets on medium term is in line with this trend (40% reduction by 2030 compared to 1990 levels), but it is likely to be revised. The report finds that limiting global warming to 1.5°C would require “rapid and far-reaching” transitions in land, energy, industry, buildings, transport, and cities. Global net human-caused emissions of carbon dioxide (CO2) would need to fall by about 45 percent from 2010 levels by 2030, reaching ‘net zero’ around 2050. This means that any remaining emissions would need to be balanced by removing CO2 from the air using advanced technology.